New Update Delivers Full Controller Support and Precise Control that Pairs Perfectly with Fortnite’s 60 FPS Capabilities on iOS Creating Console Like Gameplay. Gamevice announce that its low latency, direct connect controller is now compatible with Fortnite mobile - well timed with Fortnite’s 60 frames per second update that recently launched for iOS and now some Android devices. Fortnite for mobile is the exact same gameplay as Fortnite for console, and even allows you to play with your friends on other game systems - but mobile players were limited to only using a touchscreen. 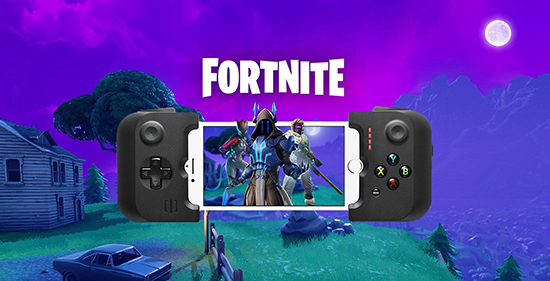 Now Fortnite mobile players can even the playing field against console rivals using Gamevice, with the precision of a low latency controller coupled with butter smooth 60 FPS on iOS. It’s the best way to compete against console counterparts! Gamevice is the best Apple MFi partner with direct Lightning support, making it the most responsive controller on iOS devices. Read the full story on Gamevice’s recent blog post giving various details on technical aspects of iOS function, matchmaking and more. Fortnite’s recent 7.3 update added full controller support for iOS and Android devices making Gamevice the key to getting the exact same experience as Fortnite for console. Now, mobile players don’t have to obscure their view by putting their greasy thumbs on the screen, they can simply snap on their Gamevice to experience unabated visuals and play at home or on the go. The preferred controller of gamers everywhere, Gamevice creates a console experience on mobile devices to more than 1,000 video games including Street Fighter IV, Minecraft, NBA 2K19 and now Fortnite! The controller has extended its critically-acclaimed functionality to users of smartphone-controlled devices including robots and drones like DJI’s Spark and Sphero’s SPRK+ robot. By providing precision control and an ergonomic design, Gamevice allows users to achieve a new level of usability and comfort over a mobile device’s touchpad interface, and offers the lowest latency of any mobile controller available.